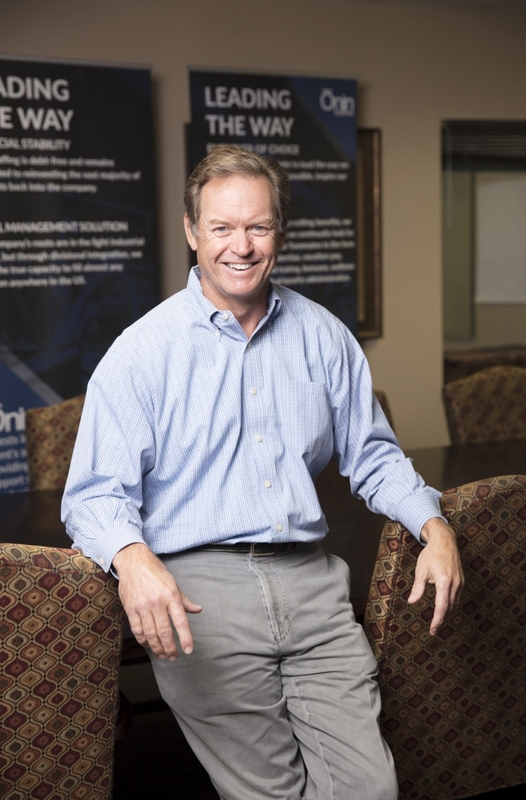 As Tuscaloosa native Hugh Thomas tells it, his career switch from advertising to industrial staffing happened around 1996 after a friend introduced him to Keith Phillips, who owned InStaff Personnel in Dallas. Phillips had opened InStaff in 1993, and after Thomas joined the firm in 1996, they opened offices in Birmingham and Tuscaloosa. But during the late 1990s, says Thomas, the labor market was tight due to low unemployment, and recruiting enough contingent workers to meet their clients’ demands meant working long hours. Renamed Onin Staffing by 2007, today the company, for which Thomas is a managing partner, is the privately held industrial and light clerical staffing division of the Birmingham-based Onin Group. The Onin Group includes several other brands such as Excelsior Staffing, A3 Solutions, Focus IT and Onin Professional Search among others. Onin Staffing has about 420 employees or “Oninites” at 93 locations across the Southeast, Southwest and Midwest. Onin recruits and places contingent workers in long- and short-term jobs. Onin Staffing’s parent company, the Onin Group, made Inc. magazine’s 2016 list of the 5, 000 Fastest Growing Companies in the United States with $284 million in revenue. Onin Group’s Director of People and Culture, Blake Stevens, says that overall, Onin Staffing handles an estimated 11, 000 contingent workers a week. Of that number, Thomas says about 30 percent work with automotive manufacturing suppliers. The workers include assembly line workers, injection molding assembly workers, auto technicians and production specialists. Onin Staffing eschews the word “temps, ” instead referring to members of its contingent workforce as “teammates, ” whether they are on short-term assignments or have worked with Onin for years. Onin Staffing offers its teammates medical insurance and has an employee assistance program for those needing short-term counseling services. In addition, the company has a scholarship program for teammates desiring to continue their education by attending college, taking certification courses or enrolling in job or skilled trades training. But, according to a summer 2015 issue of the Onin Group’s magazine, Hired, another reason for the name change has to do with the growing number of businesses — and manufacturers in particular — that are turning to temporary service agencies to help fill their labor gaps. In fact, Bureau of Labor Statistics researchers released a study in January showing that in 2003, 4.6 percent of production workers and 13.4 percent of low-skilled manual laborers were temporary service hires. By 2015, those percentages jumped to 7.3 percent and 17.9 percent respectively. Subsequently, the business world’s perception of temporary agencies has changed, Thomas says. Today, companies like Onin Staffing have gone from being a “red-headed stepchild” in the business world to a strategic partner. And, as in the early days of Onin Staffing, the labor market is tight again, says Thomas. The U.S. unemployment rate stands at about 4.3 percent, according to the Bureau of Labor Statistics. In a tough, competitive job market like this one, says Thomas, Oninites have to work even harder these days to not only recruit teammates, but also help them succeed on the job. For example, for their larger clients, Onin will often send representatives to the job site to make sure the teammates become acclimatized to the new work environment as soon as possible. The representatives will, for example, introduce teammates to client supervisors and check on them throughout the day to ensure they are able to perform the assigned duties. “You get people in a fast-paced environment and everybody knows what they’re doing in there, but for people who are new to the game, we want to shepherd that process, ” he says. To be competitive, says Thomas, the staffing company takes steps to ensure that they supply their clients with teammates who have the skills their clients want. In some instances, that has meant organizing job training for teammates. Thomas says he and his partners have made it a point over the years to invest back into the company and run it conservatively. The strategy proved especially beneficial during the nation’s financial crisis and the downturn of the auto industry from 2008 to 2010. Though auto manufacturers are utilizing more automation, Thomas is not too worried. Looking back on his career, Thomas says he still enjoys visiting his clients’ manufacturing facilities, watching the machines turn out parts and seeing how people make a living every day.